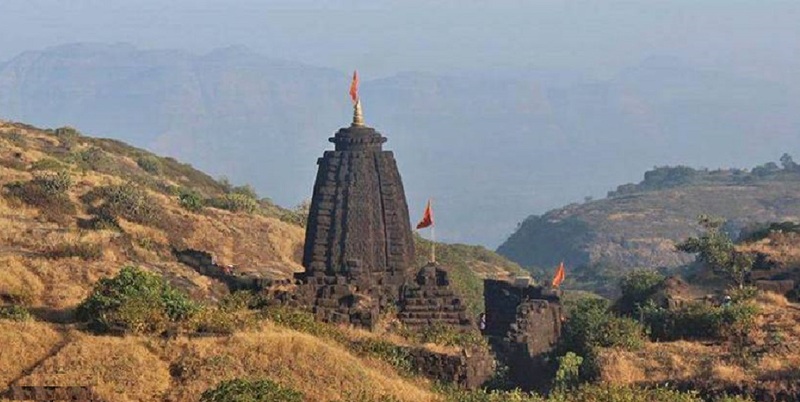 Harishchandragad is a hill fort in the Ahmednagar district. 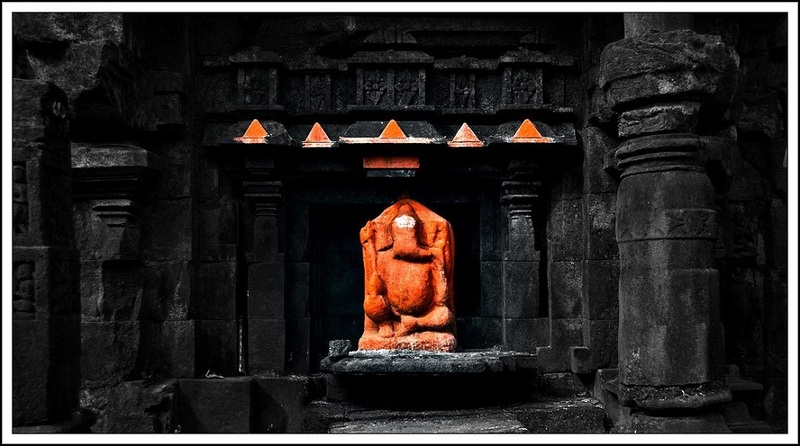 Its history is linked with that of Malshej Ghat, and it has played a major role in guarding and controlling the surrounding region. Its origin is said to have been in the 6th century, during the rule of Kalachuri dynasty. The citadel was built during this era. The various caves probably have been carved out in the 11th century. Great sage Changdev used to meditate here in the 14th century. Temple of Harishchandreshwar- This temple is marvelous example of the fine art of carving sculptures out of stones that prevailed in ancient India. It is about 16 m high from its base. Around this temple there a few caves & water tanks. 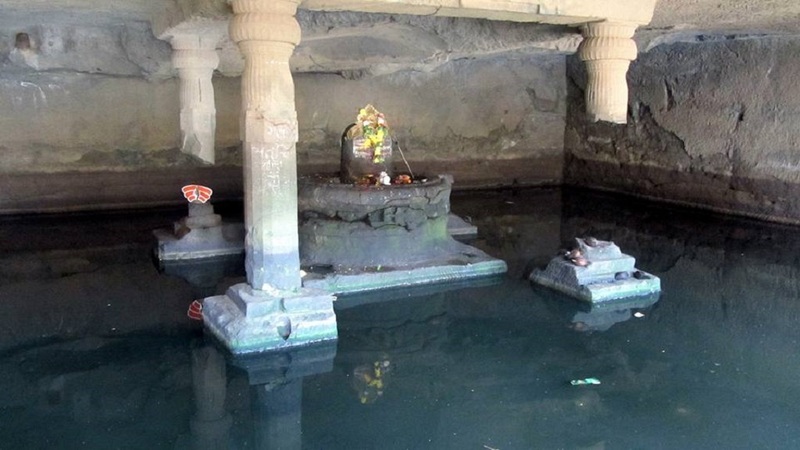 The river Mangal Ganga is said to originate from one of the tanks located close to the temple. The top of the temple resembles construction with the north-Indian temples. A similar temple is situated in Buddha-Gaya. Saptatirtha Pushkarni- To the east of the temple is a well-built lake called “Saptatirtha”. On its bank are temple-like constructions in which there are idols of Lord Vishnu. Recently these idols have been shifted in the caves near the temple of Harishchandreshwar. 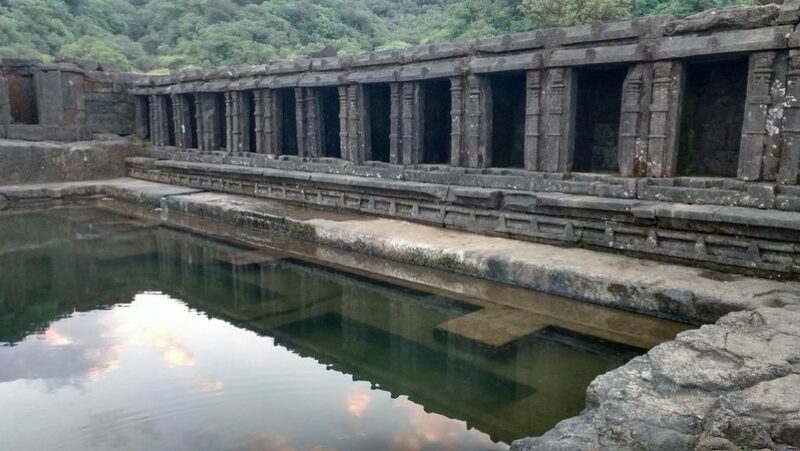 Kedareshwar Cave- Towards the right of Harishchandreshwar temple, there is the huge cave of Kedareshwar, in which there is a big Shiva Linga, which is completely surrounded by water. Its height from the base is five feet, and the water is waist-deep. There are sculptures carved out in the cave. A stream that flows near the cave is the origin of River Mangalganga. Kokan Kada- This cliff faces west and looks down upon the Konkan. It provides views of the surrounding region. The cliff has an overhang. Sometimes a circular rainbow (the Broken spectrum phenomenon) can be seen from this point. 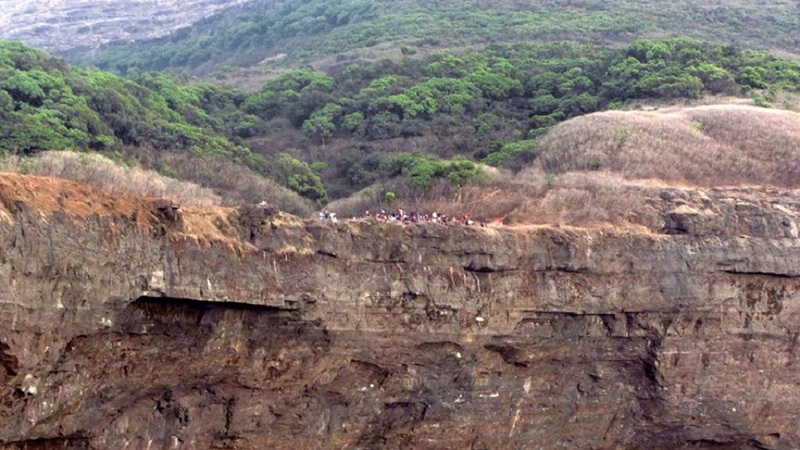 The other phenomenon that can be observed at this place is the vertical cloud burst, in which the clouds nearing the cliff get sucked into the pit fall area below and are thrown vertically into the sky reaching more than 50 feet, creating the impression of a wall that is rising straight from the edge of the cliff without entering the landmass area. 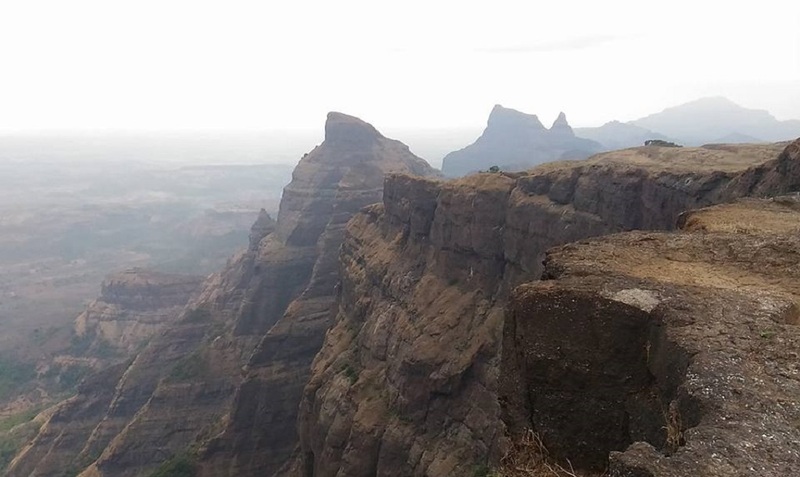 Taramati peak- This is the top most point on the fort (1429 meters). . From here we can have a glimpse of the whole range of Naneghat and Malshejghat. 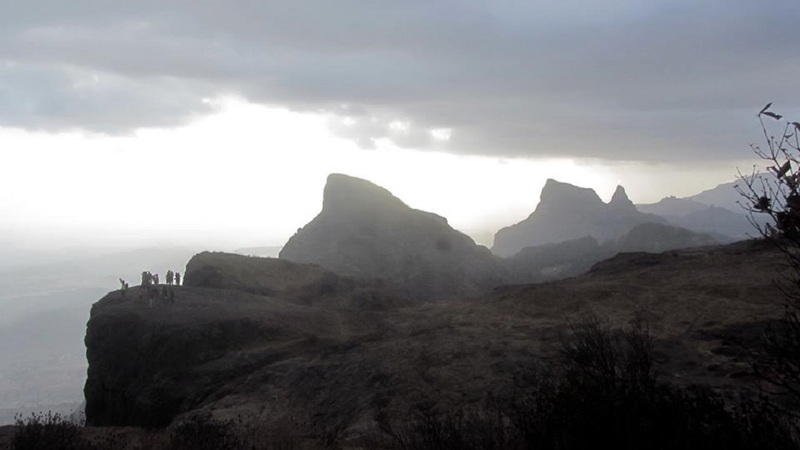 Forts Siddhagad, Ajoba, Kulang, Kalsubai peak , Bhimashankar Napta twin peaks,can be seen. Nageshwar temple near Khireshwar- This is a great antique construction, and diverse artistic works are seen on this temple. The main attraction of the carvings here is the 1.5 m long sculpture of Lord Vishnu in the sleeping posture, popularly known as "Sheshshayi Vishnu" in Marathi. It is rare and hence holds a lot of importance. Any other charges not mentioned in the Includes sections. Hiking / Trekking / Rock climbing is an adventurous activity and accidents can happen despite taking utmost caution and care. 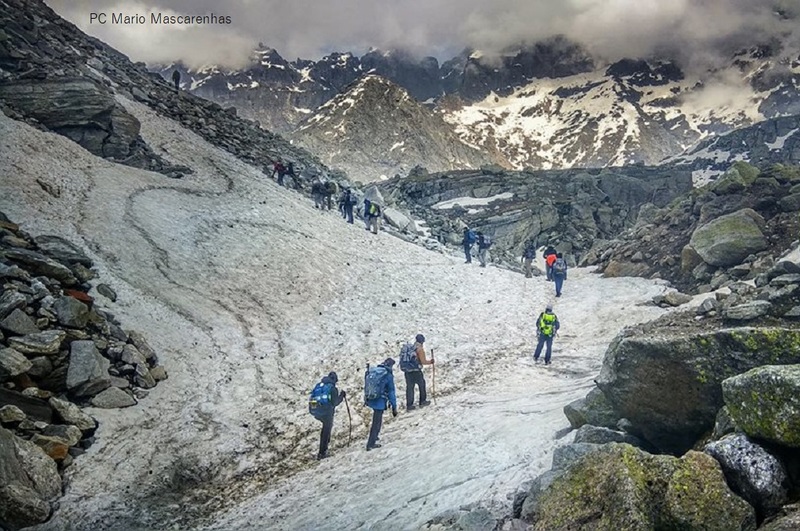 The organization will not be responsible for any injury / accident / death to the participant while on trek.